Gain a greater depth of understanding of both the purpose of and how to adjust yoga postures. Learn why, when, and how to adjust a student in a pose. Explore what makes a good adjustment. Adjustment techniques described on this site are grounded in knowledge of functional anatomy. 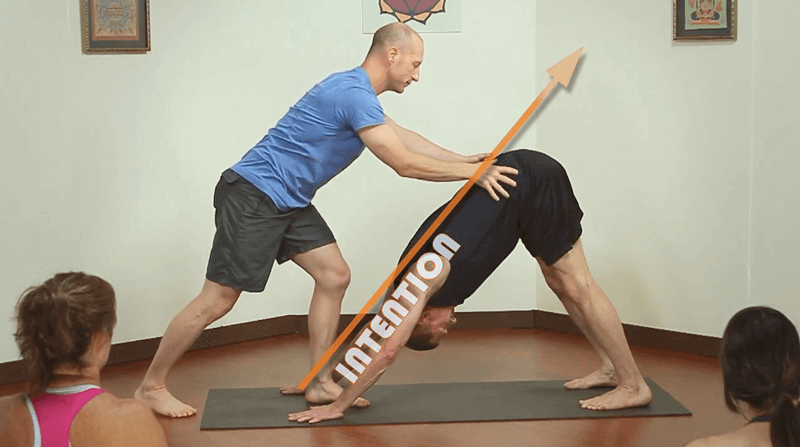 Adjusting Triangle Pose And Revolved Triangle: Where Is Your Intention? David discusses the key ideas for safely and effectively adjusting triangle pose and revolved triangle. Learn which adjustments might be helpful in this posture. Adjusting Standing Forward Bend: Where Is Your Intention? David discusses the key ideas for safely and effectively adjusting standing forward bend. Learn which adjustments might be helpful in this posture. Injuries In Yoga Adjustments: What Are Practitioners Experiencing? Most respondents reported experiencing hands-on adjustments as “Very Helpful” and did not report getting injured while receiving an adjustment. A small percentage of respondents reported an injury while being adjusted, primarily in poses that put pressure into tenuous structures in the body, like the knee joint or in proximal attachment of the hamstrings. What’s Your Intention With That Adjustment? Intention: What is it that we want to communicate to the student in this moment?…and why? Adjusting Yoga Postures… Why Bother? Doing adjustments or assists while our students are practicing yoga can be beneficial in a number of ways as we’ll see below, but it’s important that we self-reflect and ask ourselves why we are doing the adjustment in the first place. Positioning yourself relative to the person you’re adjusting is one place where good body mechanics show up. Depending on your own height and size, you will probably have to adapt your position in an adjustment to your student’s height and size. It’s easier to adapt if you are taller, because you can always bend your knees or kneel on the floor if the other person is shorter than you. It is more difficult to position yourself well when you’re vertically challenged and you want to adjust someone who is particularly tall. In this case, good body mechanics might mean a lighter touch and more verbal cues than physical adjustments. Yoga Adjustments: Feel and Sense What’s Going On! 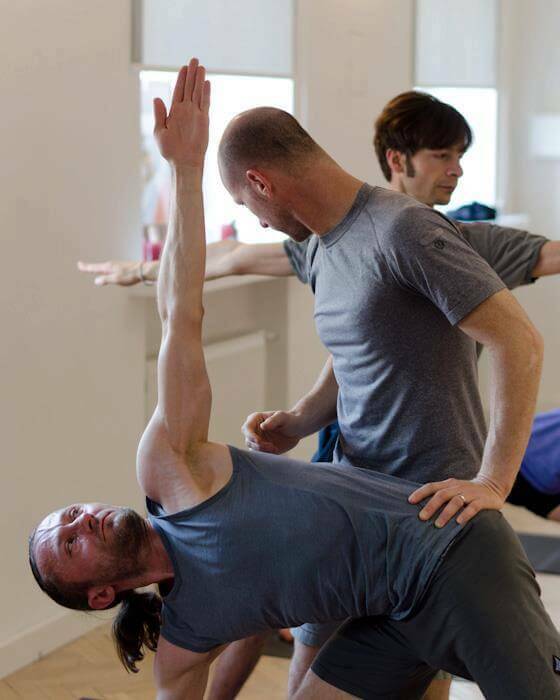 At the heart of putting your hands on someone to adjust or assist them in a yoga posture is the idea of being aware of what you feel and sense when you touch them. The number one reason that students get injured by teachers is because the teacher was not aware of what they were feeling. 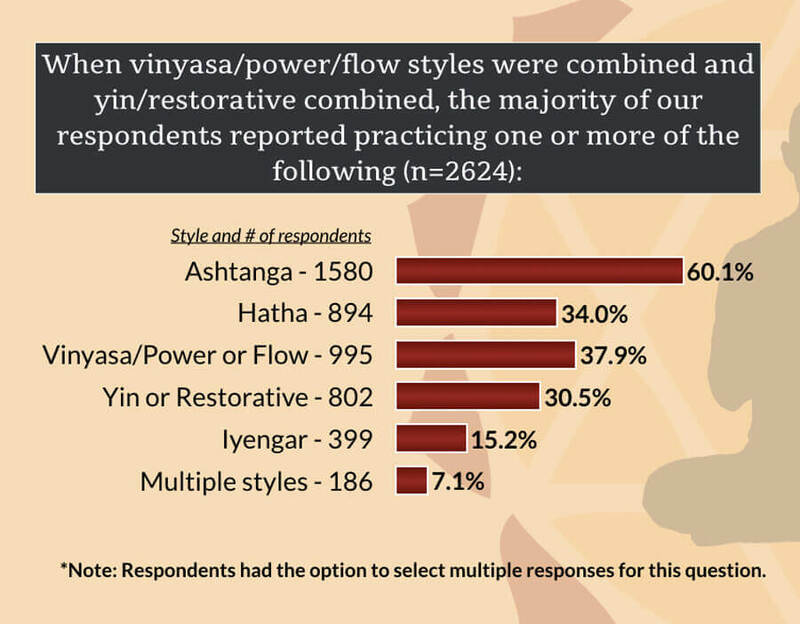 There is no better place to start discussing yoga adjustments than with what initially creates our desire to adjust or assist a student in a yoga posture.